The researchers report in the journal Proceedings of the National Academy of Sciences a technique that allowed them to record 3-D footage of neural activity in the nematode Caenorhabditis elegans, a worm species 1 millimeter long with a nervous system containing a mere 302 neurons. The researchers correlated the activity of 77 neurons from the animal’s nervous system with specific behaviors, such as backward or forward motion and turning. Much previous work related to neuron activity either focuses on small subregions of the brain or is based on observations of organisms that are unconscious or somehow limited in mobility, explained corresponding author Andrew Leifer, an associate research scholar in Princeton’s Lewis-Sigler Institute for Integrative Genomics. “This system is exciting because it provides the most detailed picture yet of brain-wide neural activity with single-neuron resolution in the brain of an animal that is free to move around,” Leifer said. A current focus in neuroscience is understanding how networks of neurons coordinate to produce behavior, Leifer said. The technology to record from numerous neurons as an animal goes about its normal activities, however, has been slow to develop, he said. 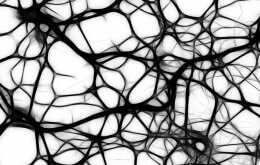 Neural networks are infinitesimal arrangements of chemical signals and electrical impulses that can include, as in humans, billions of cells. The simpler nervous system of C. elegans provided the researchers with a more manageable testing ground for their instrument. Yet, it also could reveal information about how neurons work together that applies to more complex organisms, Leifer said. For instance, the researchers were surprised by the number of neurons involved in the seemingly simple act of turning around. “One reason we were successful was that we chose to work with a very simple organism,” Leifer said. “It would be immensely more difficult to perform whole-brain recordings in humans. The technology needed to perform similar recordings in humans is many years away. “By studying how the brain works in a simple animal like the worm, however, we hope to gain insights into how collections of neurons work that are universal for all brains, even humans,” he said. Leifer worked with co-first authors Jeffrey Nguyen, a postdoctoral research associate in the Lewis-Sigler Institute, and Frederick Shipley, a former research associate in the Lewis-Sigler Institute now a Ph.D. candidate in biophysics at Harvard University. The team also included Joshua Shaevitz, an associate professor of physics and the Lewis-Sigler Institute for Integrative Genomics; Ashley Linder, Mochi Liu and Sagar Setru, graduate students under Leifer and Shaevitz; and George Plummer, a former research associate at the Lewis-Sigler Institute who is now a medical student at Tufts University. The researchers designed an instrument that captures calcium levels in brain cells as they communicate with one another. The level of calcium in each brain cell tells the researchers how active that cell is in its communication with other cells in the nervous system. The researchers induced the nemotodes’ brain cells to generate a protein known as a calcium indicator that becomes fluorescent when it comes in contact with calcium. The researchers used a special type of microscope to record in 3-D both the nematodes’ free movements and neuron-level calcium activity for more than four minutes. Three-dimensional software the researchers designed monitored the position of an animal’s head in real time as a motorized platform automatically adjusted to keep the animal within the field of view of a series of cameras. The entire setup drew from various disciplines and techniques, including physics, computer science and engineering, Leifer said. For instance, the real-time computer vision algorithms the researchers used to track the worms’ brains are similar in principle to the ones used in robotics or in self-driving cars. Even more about the inner workings of the C. elegans nervous system remains to be extracted from the researchers’ data over the next year, Leifer said. The team is currently working to flesh out the correlations between neural activity and behavior in general. “These recordings are very large and we have only begun the process of carefully mining all of the data,” Leifer said. The paper, “Whole-brain calcium imaging with cellular resolution in freely behaving Caenorhabditis elegans,” was published online ahead of print Dec. 28 by the Proceedings of the National Academy of Sciences. The work was supported by the Simons Foundation (grant SCGB 324285); Princeton’s Office of the Dean for Research Innovation Fund for New Ideas in the Natural Sciences; and a National Institutes of Health institutional training grant through the Princeton Neuroscience Institute.